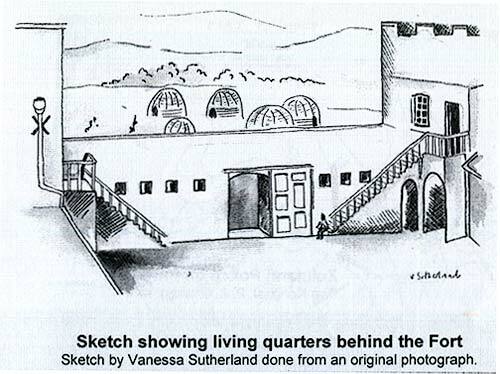 ​This late nineteenth century fort is situated on the south-eastern edge of the town of Eshowe. 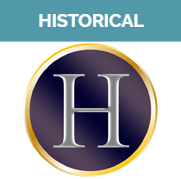 In 1873 the Hlubi tribe under Chief Langalibalele who lived among the foothills of the Drakensberg under the shadow of the mighty Champagne Castle and Cathkin Peak, came into conflict with the Natal Government. 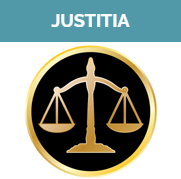 After the rebellion the Government instituted the Natal Mounted Police, a mixed force of Whites and non-Whites known to the Zulus as the Nongqai. This body of police played an important part on various occasions. 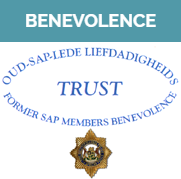 Twenty-five of its members accompanied Sir Theophilus Shepstone in 1877 on his journey to the Transvaal to annex that territory and from 1883 to 1888 they helped to quell the unrest in Zululand that followed on the return of Cetshwayo and his death. 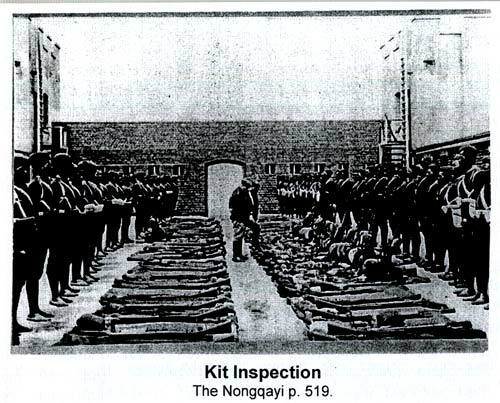 The Nongqai served with distinction, not least in the Anglo-Boer War (1899-1902), before the unit was disbanded without warning in 1904. When they were recalled in 1906, at the time of the Bhambatho uprising, 120 former members responded. The unit was disbanded again afterwards. 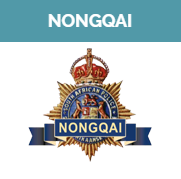 The magazine of the South African Police was named Nongqai in honour of the unit. 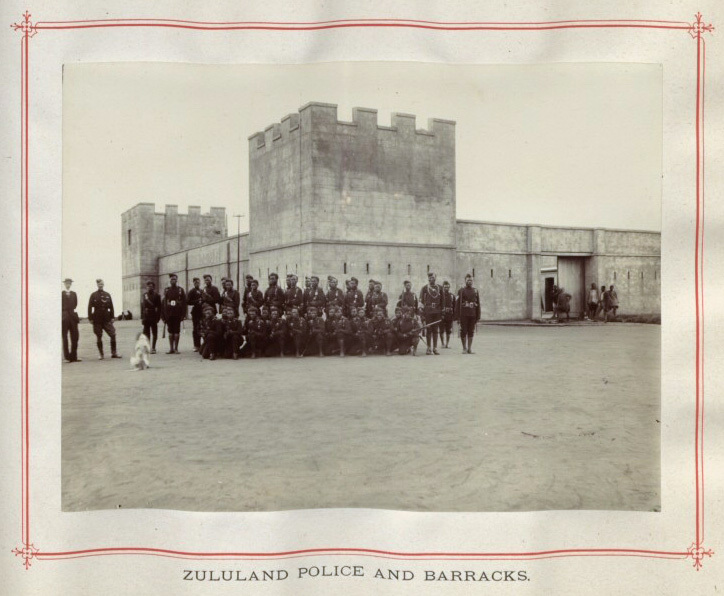 A detachment of this force served as a bodyguard for the Resident Commissioner of Zululand, Sir Melmoth Osborne, and the Nongqai fort was built by the Imperial Government to accommodate these men. It was built of brick and provided with loopholes, and at the corners there were towers, three storeys high, on which guns could be mounted. After the Nongqai had been disbanded the building was used for a long time as a depot by the Road’s Department of the Natal Provincial Administration. More recently it has been converted into a most interesting historical museum by the Municipality of Eshowe. 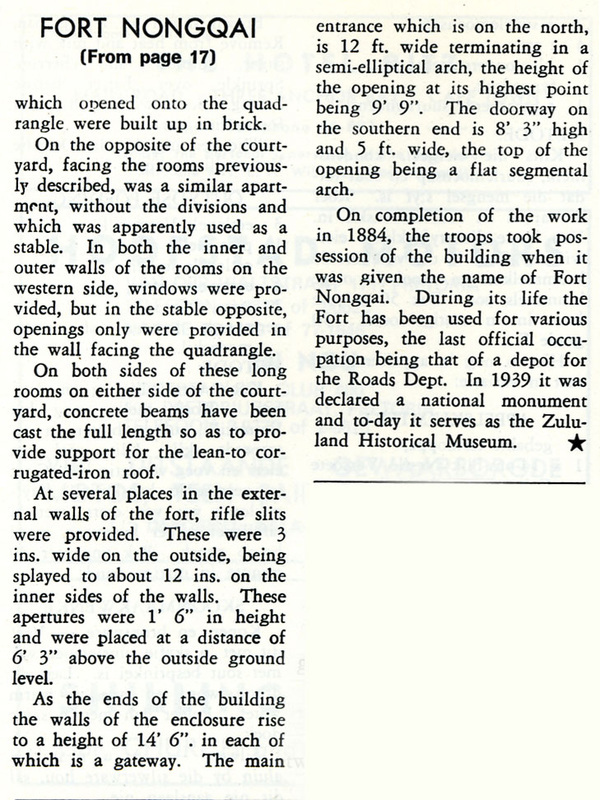 From the booklet: The Nongqayi (the old Nongqai). 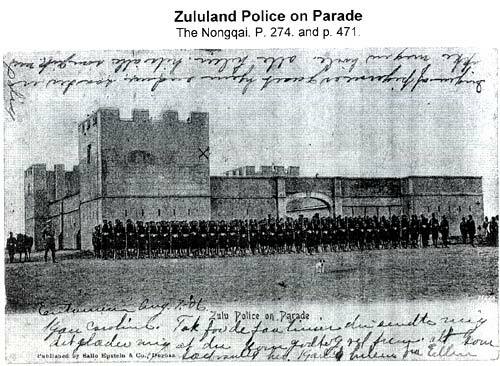 A History of the Zululand Police by Dr Tony Cubbin, p 15. From the booklet: The Nongqayi (the old Nongqai). A History of the Zululand Police by Dr Tony Cubbin, p 19. 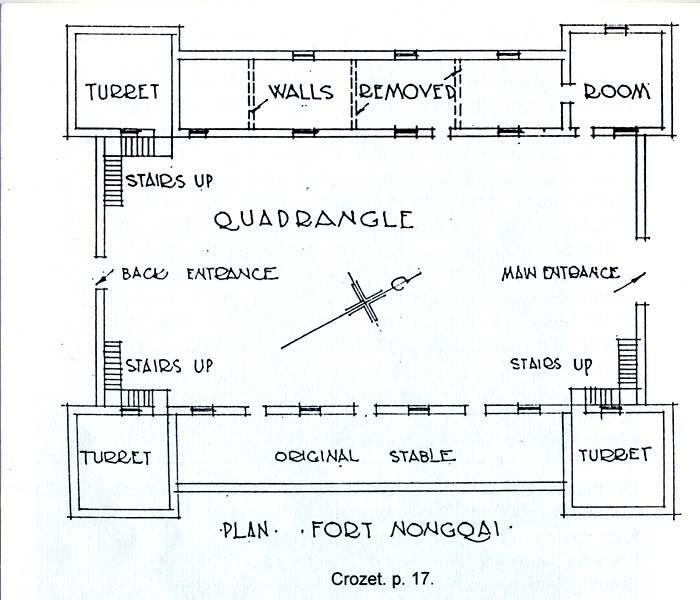 From the booklet: The Nongqayi (the old Nongqai). 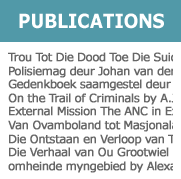 A History of the Zululand Police by Dr Tony Cubbin, p 20. From the booklet: The Nongqayi (the old Nongqai). A History of the Zululand Police by Dr Tony Cubbin, p 21. 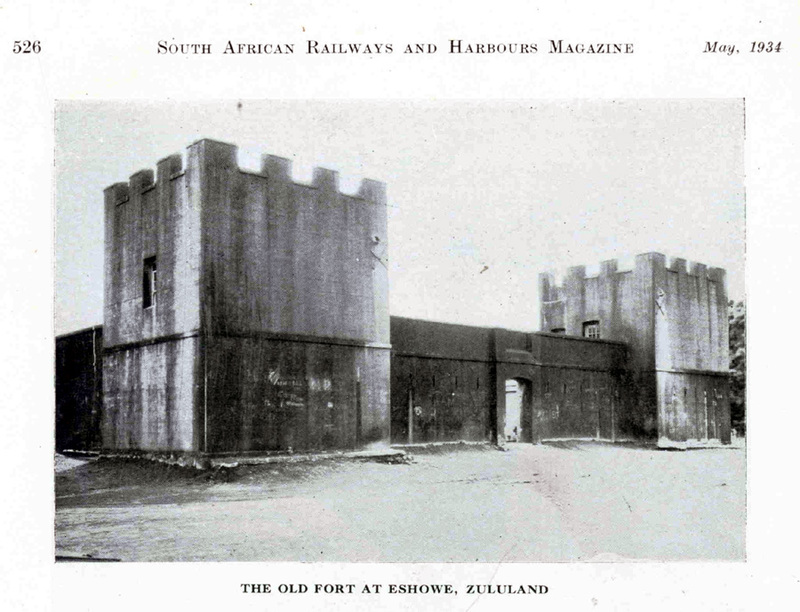 Fort Nongqai: South African Railways & Harbours Magazine May 1934 p 526. 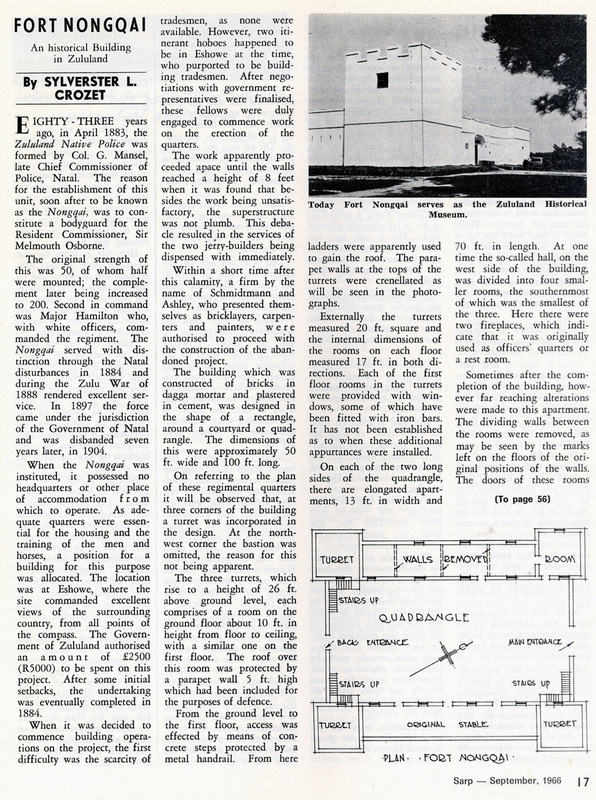 SARP (South African Police Magazine) Sept 1966 pp 17 & 18.